New high school Chief Science Officers shared a light moment during a CSO Training Institute team-building session. Several dozen new Chief Science Officers (CSOs) from across Arizona thrust their hands in the air to answer the question posed to the group. Jessica Hauer, leading a “Stem-onstrations” session, stressed the value of clear communication. 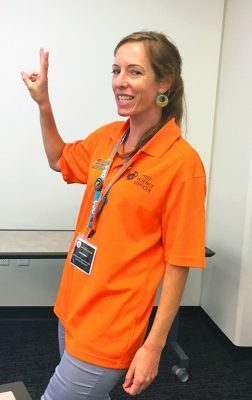 “Why is it important to be able to communicate a scientific concept like electricity?” asked Jessica Hauer, an educator teaching sessions at this week’s CSO Training Institute, hosted by Grand Canyon University. Each of three students selected to respond stood to make their answer heard, and the third teenager’s voice quavered with emotion. “It’s part of our jobs as CSOs to share our passion for science and to teach people what we are passionate about,” she said. The session, “Stem-onstrations,” is part of the curriculum offered during the intensive training institute at GCU. 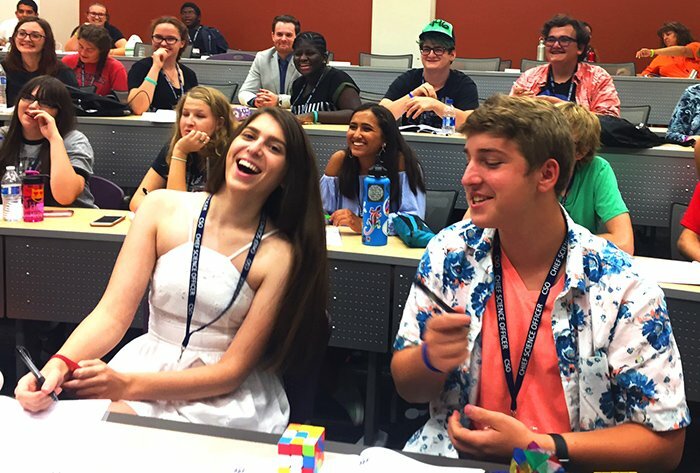 More than 130 Arizona CSOs in grades 6-12 are attending the four-day program, which ends Friday. Like student body presidents, CSOs are elected by students at the end of the previous school year. In Arizona, more than 350 CSOs were recently elected. They act as ambassadors for science, technology, engineering and math (STEM) activities at their school and in their community. CSOs identify science opportunities and are the champions of student engagement and interest in STEM subjects. “When you can take STEM, entrepreneurship and leadership and combine it together, now you have innovative and creativity combined with marketability,” said Olenka Cullinan of risingtycoons.org, who is also teaching at the Institute. 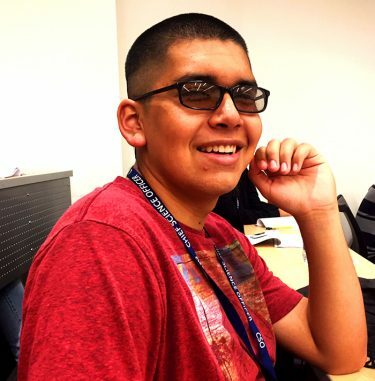 Samuel Sesena, a senior from Carl Hayden Community High School in Phoenix, was one of more than 130 attendees. GCU’s Strategic Educational Alliances is a driving force in the CSO program, which was launched in 2015 by Arizona SciTech and the Arizona Technology Council Foundation, headed by executive director Dr. Jeremy Babendure. Arizona’s initiative has become a national prototype. Thirteen states have launched the program, and more are on the horizon. The training offers students the opportunity to define their STEM passions, devise action plans and hone their communication, leadership and strategic-planning skills. The Stem-onstrations session Hauer led is intended to coach students in how to inspire and excite others by giving scientific presentations. The students were practicing their demonstrations and planned to present them to a wider audience Friday. An earlier team-building session led by Cullinan encouraged positive thinking as a tool to increase confidence and leadership ability. “Your thoughts will control you, your outcomes and how other people think of you,” Cullinan said. In one exercise, students were asked to list three “guilty pleasures” and then to turn them around into three positive actions. Samuel Sesena, a senior from Carl Hayden Community High School in Phoenix, wasn’t alone in listing video games, YouTube and eating too much food as guilty pleasures. His positive actions are to spend more time cooking, cleaning and reading. Darrell Clauschee, a sixth-grade teacher at Eisenhower Center for Innovation in Mesa, praised the Institute. 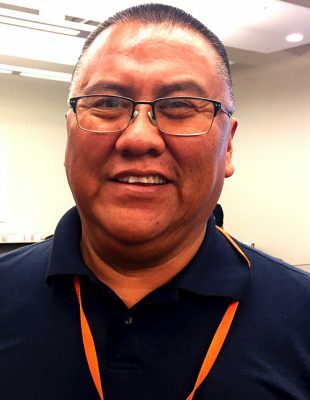 Darrell Clauschee, a sixth-grade teacher at Eisenhower Center for Innovation in Mesa, praised the Institute’s role in developing important character traits.